The most advanced, flexible and effective Metaza Photo Engraver yet. Perfect for gift personalization or medical and industrial part marking (part marking kit sold separately). 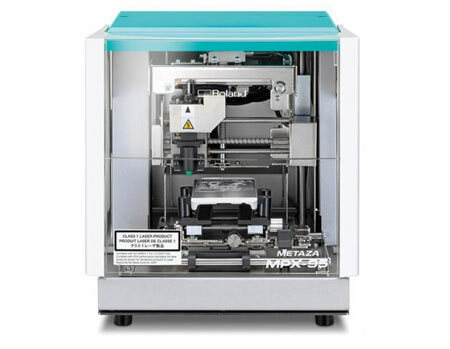 The new METAZA MPX-95 photo impact printer is a cost-effective, easy-to-operate engraver that anyone can use to mark gold, silver, copper, platinum, brass, aluminum, iron, stainless steel, titanium and more. Produce one-of-a-kind jewellery featuring special photos of children and pets or create unique promotional products for business events, all for a fraction of the cost of a comparable laser engraver. The MPX95 Photo Engraver is easy to use and no previous engraving experience is required to quickly turn ordinary gifts and promotional items into cherished mementos with a uniquely personal engraving. With the Gift Kit (sold separately) it's perfect for kiosks and gift shop applications, the new METAZA MPX-95 photo impact printer with Gift Kit is a low-cost, easy-to-operate solution for personalizing high-value metal items and making them even more unique and more valuable with a customized message of picture.